Windows 8 operating system comes with in-built option for supporting 16 bit applications. Now you can play those vintage DOS based games on Windows 8 systems without any third party hacks. Unlike in Windows 7 and Vista where you have install apps like DOS box for such support. 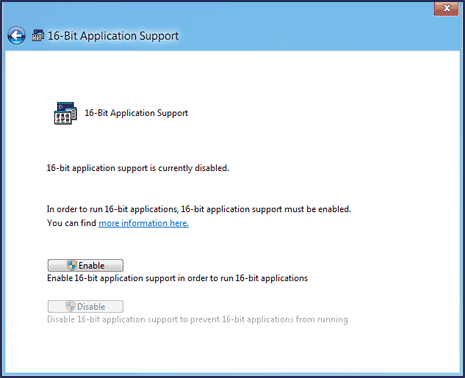 With in-built support feature, you just need to enable (or activate) the 16 bit Application Support option to get going. 1. Open Control Panel on your Windows 8 computer from Start > Control Panel. Alternatively, you can open Run box by pressing Win + R keys, then type Control Panel and press the Enter key. 2. At top right of Control Panel, change view by to “small icons” and look for 16 – Bit Application Support option at top left part. 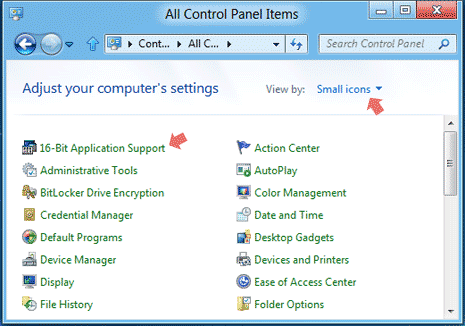 Click 16 Bit Application Support icon to open settings box with Enable and Disable button. 3. Then click Enable button to activating 16 bit application support for running 16 bit application programs on your Windows 8 computer. You may disable it anytime by clicking Disable button on settings box. If you attempt to run any 16 bit application on your Windows 8 PC, you will get prompt to enable 16 Bit Application Support if not already enabled. Playing good old vintage DOS based games just came more easier on Windows 8, just enable this feature and enjoy the game play! why in my windows 8 have no icon 16 bit application support? Can you help me how to fix it.